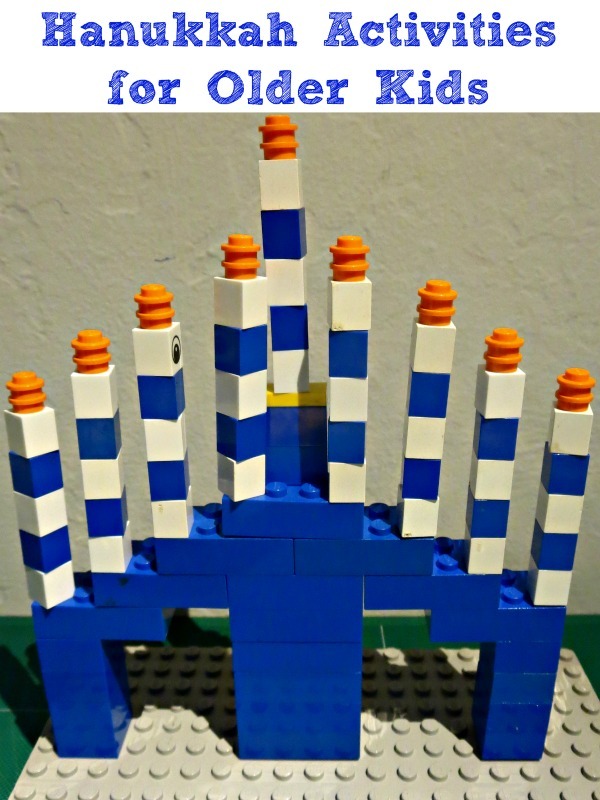 Do you want to introduce Hanukkah to older children? Here are some activities that you might consider. Every year we pick books to read during Hanukkah time. Our selection changed over time as our daughter gets older. I pulled our favorites in the round up of 8 Books for 8 Nights of Hanukkah (my contribution to Multicultural Kid Blogs) and indicated recommended age for each book. This year we kicked off our Hanukkah reading with Our Eight Nights of Hanukkah written by Michael J. Rosen and illustrated by dyAnne DiSalvo-Ryan. This book describes Hanukkah celebrations in the religious American Jewish family narrated by a boy who is about 8 or 9. I like that the book briefly explains the origin of the holiday and the reason behind lighting the menorah candles. It also highlights the themes of charity, of family togetherness, and of respecting other religions, but doesn’t gloss over the reason Jewish children love Hanukkah so much – presents, presents, and more presents! But… We Are Not Jewish, Are We? This year was the first year my 8 year old asked this question. I think being Jewish is more confusing to her than, say, being a German, since being Jewish is associated both with the religion and with “blood heritage”. In heritage I am three quarters Jewish and proud to be one. However, I never practiced Judaism and don’t plan to become a practicing Jew. This is exactly what I discussed with my daughter yesterday – how we want to treasure and appreciate traditions from our ancestry even if we don’t follow the religion of our ancestors. Her mind quickly jumped from philosophical questions to mathematical calculations of how much of “Jewish heritage” she will be carrying forward. Smarty is eagerly looking to three traditions of Hanukkah in our household – lighting menorah candles, playing dreidel games and making latkes. I expect her to do everything that is needed for latkes this year except frying them. When she was younger, we made some guided Hanukkah art projects, but then she lost interest. 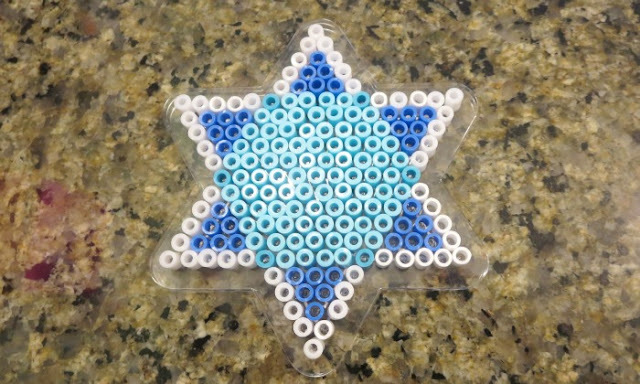 This year she didn’t need any guidance – she made a beautiful Hanukkah Perle bead star (above) as a present for grandparents, and tried her hand constructing menorah out of loose Lego bricks. Other older children might chose to reenact Hanukkah story with puppets, to write a poem or a story or to draw pictures. I am actually very interested to see what Smarty might do next year! If you asked your older child (over 8) to do a creative activity for any holiday, what kind of project would he or she choose? I can't even imagine what they'd come up with. I've got pictures sitting in a folder to write a post on Hanukkah, I think it'll be scheduled for next year because I won't be getting the editing done in time for this year. I love doing creative projects for Hanukkah! and thanks for linking to my Hanukkah board!